I have learned that my car horn is woefully inadequate. Imagine that you are driving and some IDIOT decides they are going to turn left from the go straight lane and they must assume that you’ll naturally dodge them. Or perhaps they didn’t think at all? At any rate they’re coming right at you and you do the only thing you can do in that situation… swerve and lay on that horn. This isn’t the first time my car horn has let me down and it certainly won’t be the last. I needed a “hey a-hole what do you think you’re doing? Look where you’re going bud!” blare and I got a “hey y’all whatcha up to?” toot. So then I’m mad for 2 reasons. 1: I almost got hit by a car. 2: My car horn couldn’t properly convey the irritation I find myself in when dealing with stupid drivers. I was set to come home and make these lovely cupcake toppers that day but in the end I wound up eating junk and messing around on my computer instead :) So here they are a good 2 weeks later than my editorial calendar had hoped for. 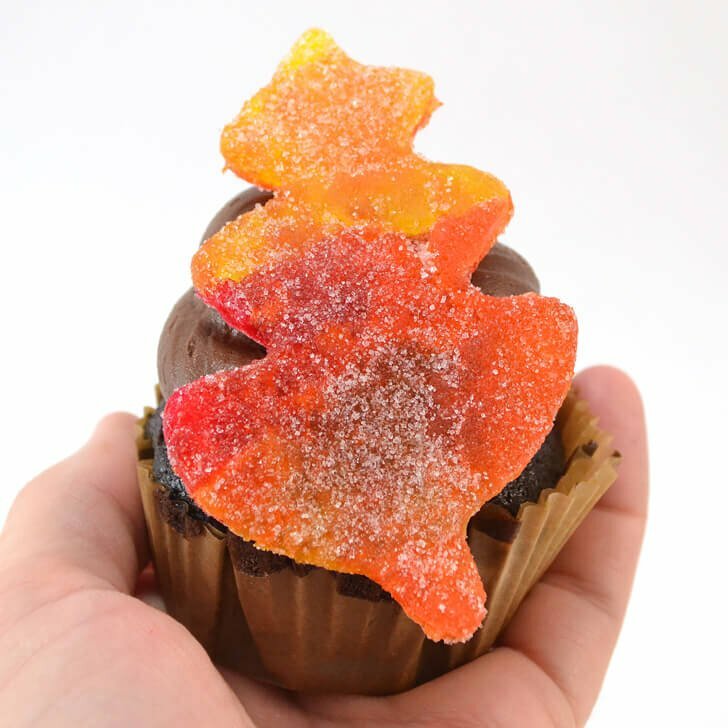 It’s been a long time comin’ but I hope you love these sweet gummy leaf candy cupcake toppers as much as I do! Now I didn’t manage to get a bunch of pictures of the process so I’m going to have to use my words. Bear with me! 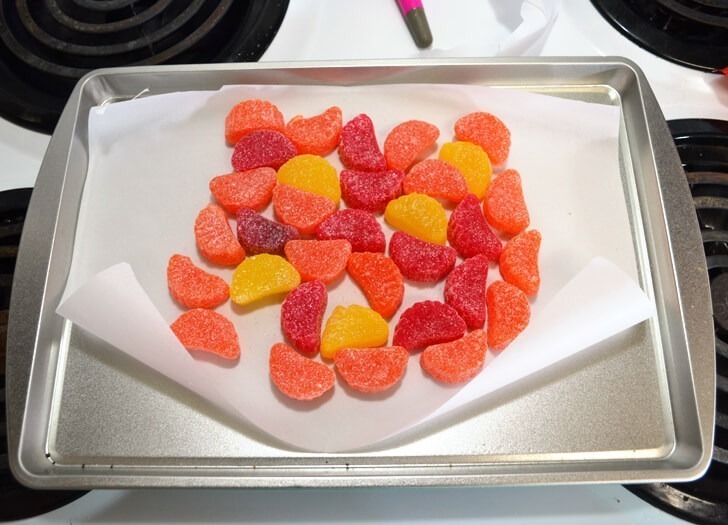 Preheat your oven to 350 degrees and line a cookie sheet with parchment paper and arrange your fruit slice candies on top of it. In my first go I used the entire bag including green and purple colors but I decided I preferred the red, yellow and orange colors best from my second batch. Place in the oven for 20 minutes and take a peek inside. Are your candies shiny? 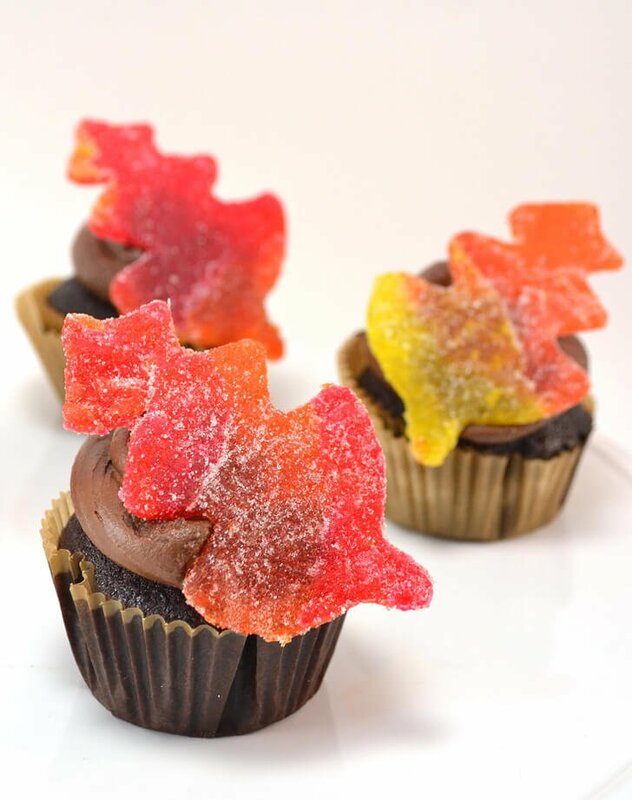 Has the sugar outside melted away and is covering the candies with a glossy shine? If not leave these suckers in the oven for a while longer. Check on them every 5 minutes. When they are shiny and ready to go carefully turn them out onto a larger piece of parchment paper on your counter top. 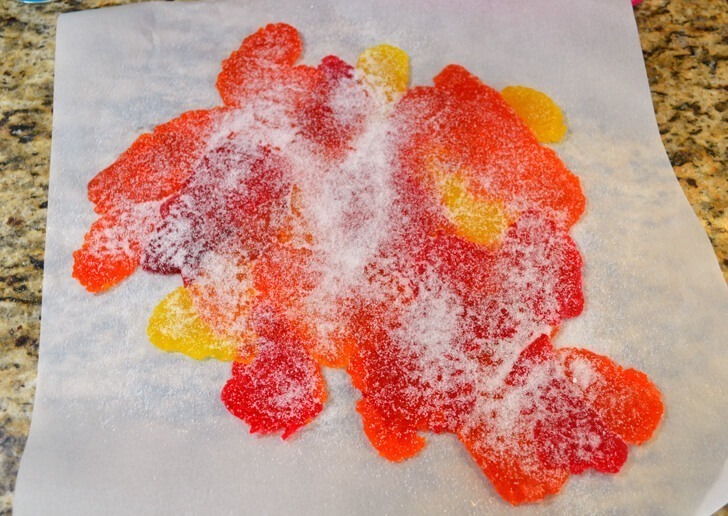 Place another piece of parchment paper on top of the candies and use a rolling pin to flatten them out like a steam roller over a cartoon character. It probably goes without saying but BE VERY, VERY CAREFUL. This stuff is melty and SO HOT that it will crazy burn you. If you need to move things around, say your roller pushed some candy apart, use a knife to push the candy back in place. Do NOT use your hands! Now I a really good quality, sharp cookie cutter is going to work wonders for you. My cookie cutters sucked so it was a pain in the royal rear to get these things cut out. If your cutters are a bit on the dull side, too, no worries it can get done it will just take longer. 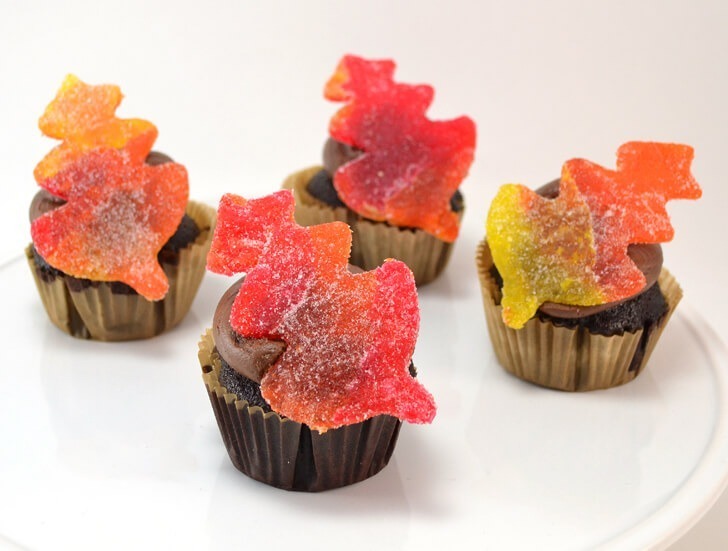 Sprinkle the top of your candy with sugar to help make it less sticky. You can flip between the pieces of parchment paper and sugar the other side, too. 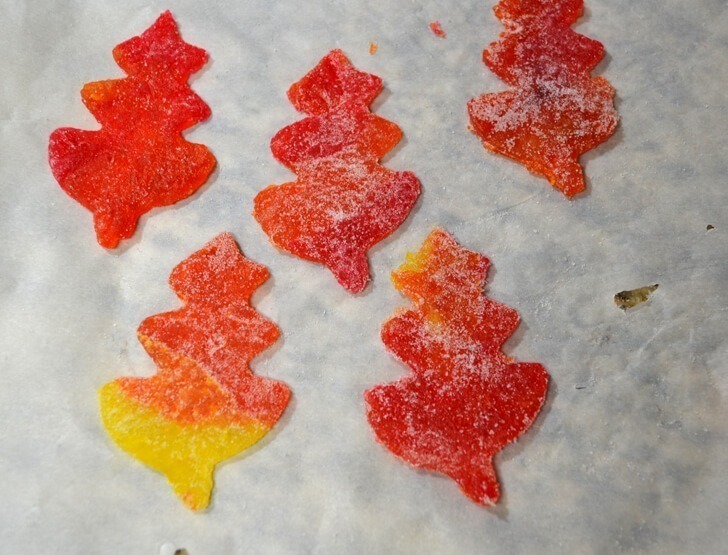 You have to work cutting out your leaf shapes while the candy is still hot. As it cools off it becomes too hard to be handled by the cutters. Place your cutter on the hot goo and use a pulling motion to get it away from the big mass. 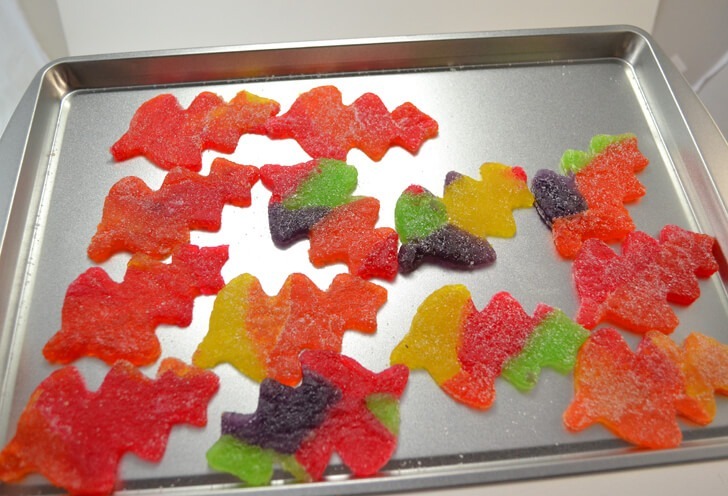 If anything sticks in the divots or won’t come away, use a sharp knife help the gummy take shape. 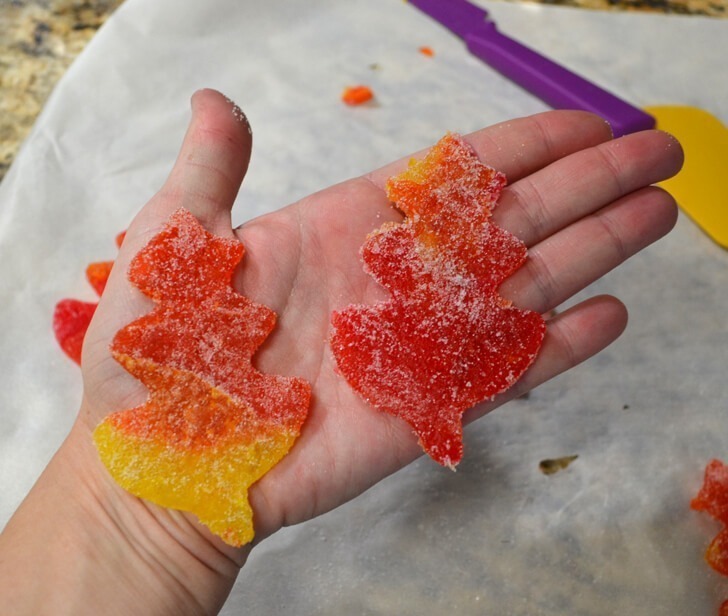 Use a silicone or rubber spatula to push the candy out of the cutter. Again, this stuff is super hot. If your candy cools too quickly, place back in the oven for 5-10 minutes and get it loose enough to cut again. Give a good 5 or 10 minutes to cool and use your fingers to smooth out the edges of each leaf. You might can tell from the picture above that the one on the left look nice and smooth but the other look raggedy. That’s because the left one has been smoothed and other has not. It’s really no big deal to do but the results are so much nicer in the end… Just pick up the leaf and push all around to make a smooth edge. Boom. Here are all of my leaves. I decided I didn’t like the ones with purple and green. They look too much like a patchwork quilt to me. While still edible, there is something that does happen to the candy that makes you feel like you might lose a filling. Or two, or three. I’ve learned to listen to that little voice in my head and I suggest caution when eating these if you have a hard time with sticky foods. Frost your cupcakes simply. 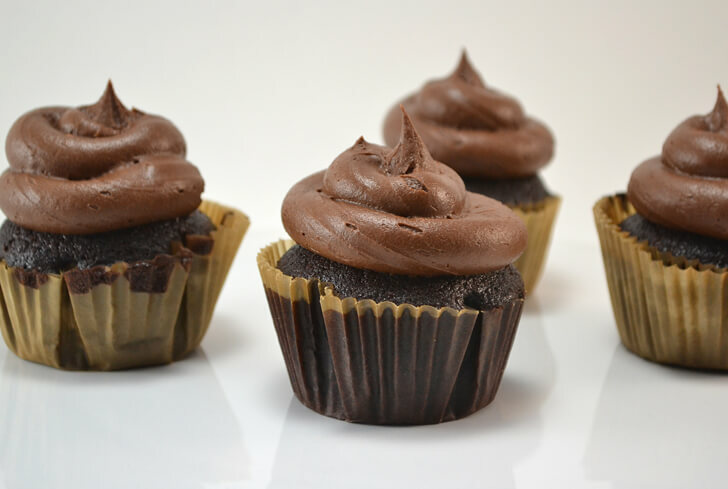 I used my favorite chocolate icing recipe below. It’s actually for only 6 cupcakes but you can increase the recipe as needed. Shove a leaf kind of caddywhompus on the top of the icing. Now I made a ton of leaves and I only decorated 6 cupcakes. It’s an obvious misstep and I don’t know what to tell you :) so let’s get on to that amazing chocolate frosting recipe instead! 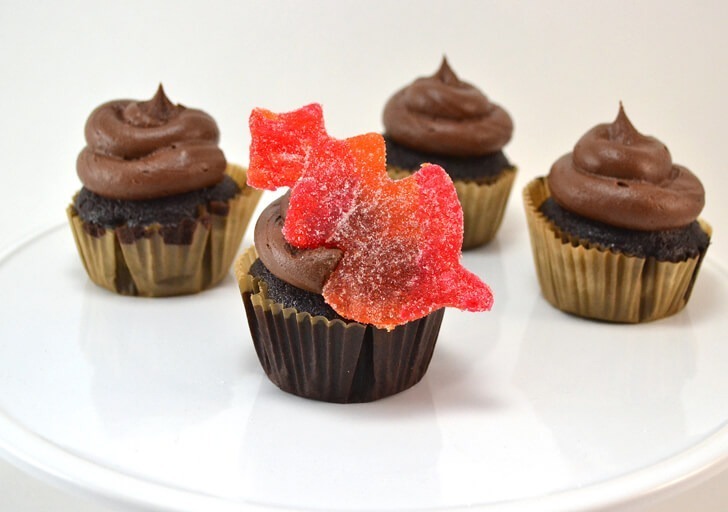 This recipe is for decent dollop of frosting on 6 cupcakes. Increase the recipe as needed. It is the perfect consistency for piping and getting pretty, decorated results on your baby cakes. Sift together your sugar and cocoa powder into your bowl. Beat using your mixer on low speed. Your frosting will start to form. Add milk to help thin out and get your frosting to the right consistency. 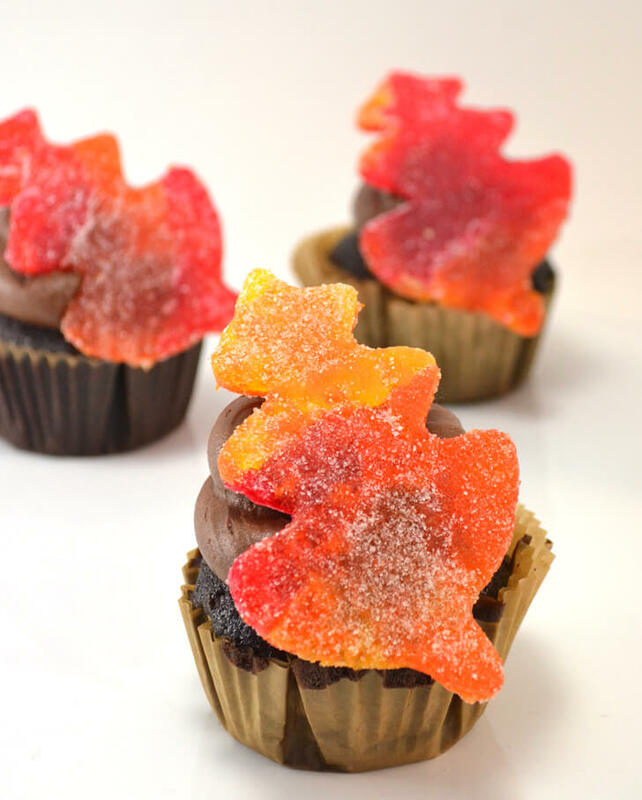 Each cupcake is simple and pretty… everything I think of when I consider Autumn. 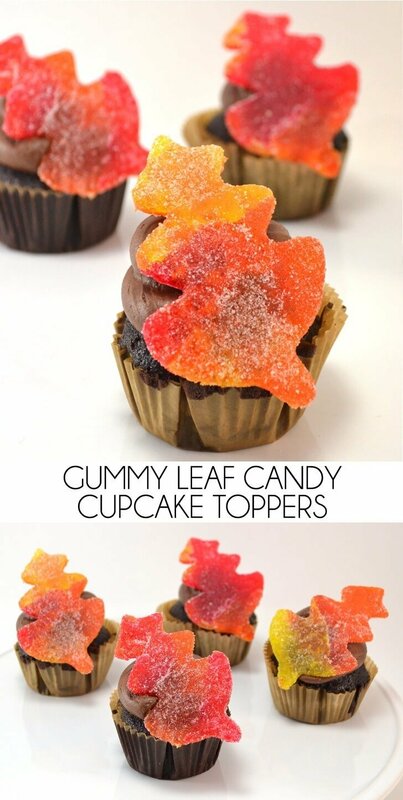 The leaves each have the fun changing of colors and as an extra bonus everything (except the wrapper, obvi) is edible!